Today’s post is another guest post from Trader Tim. Tim has his own blog here, and you can also find him on Twitter here. The views expressed in the article below are Tim’s and may not reflect those of Mike or 7 Circles. This is the first post in a fortnightly series that will delve into the world of ethical investing. This series will look at different sectors and highlight areas within these sectors that may offer an opportunity for ethical investment. We will also analyse some stocks in these sectors that would perform well against ethical criteria. Ethical investing is on the rise. As society becomes more conscious about where their products come from and who they work for, they are also increasingly more conscious about where they invest their money. In the UK alone, there are over 90 ethical funds that investors can choose to put their money into. These ethical funds currently hold a combined wealth of £13.5 billion. The overall aim of this series is to help educate readers on how they can identify and invest in ethical stocks themselves, rather than rely on a fund manager. Different people place weight on different things, which causes them to come to different conclusions about ways to invest ethically. We will see as we analyse companies that very few companies tick all the ‘ethical boxes’, so it depends more on which ethical considerations you, as an investor, lend more weight to. For example, you may be comfortable investing in stocks that promote gambling and alcohol, but wish to avoid stocks that pollute the environment. Others may not share this view. This is the process used to search for stocks based on ethical criteria. It’s similar to a traditional stock screener, which may filter companies based on technical and/or financial parameters to form an investment strategy. The categories of screening are split into two: positive and negative. This approach identifies stocks based on ‘positive’ things they are doing. Essentially, to what extent is a company promoting or supporting an ethical initiative, policy or cause. This could also be referred to as ‘light green’ funds or ‘light green’ stocks. Social – the company has impact on society in a positive way. These are just a few examples and is certainly not a definitive list. However, hopefully you can see the theme among positive issues is that there is an emphasis on promoting ethical issues and identifying companies that are worthy of investment. It’s inclusive. Negative screening is the opposite of positive screening. Instead of investing in companies that actively support certain ethical causes, negative screening functions as an ‘ethical blacklist’. It identifies companies, which are supporting actions or behaviours that are considered unethical. These may be labelled ‘dark green’ funds or stocks. These companies are then excluded. This approach identifies companies that are not considered an ethical investment. The danger here is that negative screening can result in an uncompromising approach. As a result, whole sectors can be more or less wiped out and excluded from investment. This can cause fund managers headaches when it comes to diversification. In reality, fund managers and investors use a blended approach looking both at certain ‘negative factors’ in conjunction with ‘positive issues’. This is where subjectivity of ethical investment comes in. No company will satisfy all the criteria, so it requires selective judgement for the investor. Some funds use a “best of breed” approach. The assumption may be that ethical investing must inhibit your investment returns. Acting ethically in the modern day is usually associated with some form of sacrifice or trade-off. For example, if you want ethically sourced products, you have to pay a premium. Is this also true of investing? Does investing ethically reduce your return on investment? Honestly, this depends. There are plenty of ‘ethical’ investments that have performed well. However, some have also performed poorly. There is very little to suggest that investing ethically by definition will inhibit returns. Like with all investing ethical or otherwise, it depends on stock selection or even fund selections. 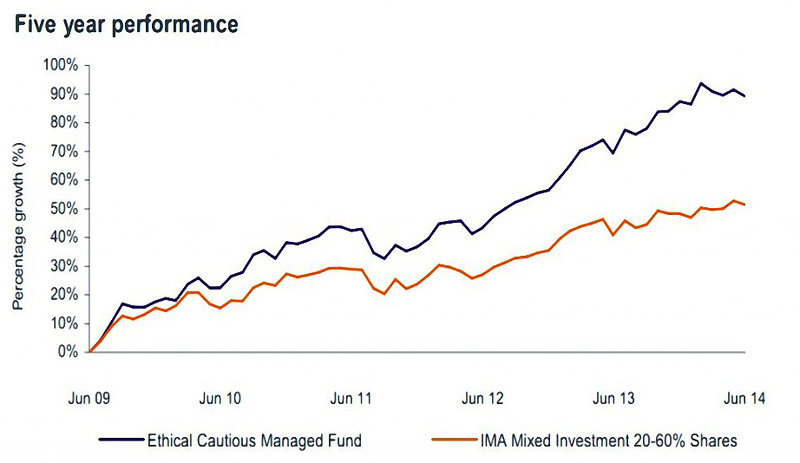 As shown above, Kames’ ethical fund outperforms a similarly constructed fund with no ethical focus across a 5 year period. In recent years, ethical funds have actually performed very well. Low exposure to miners, commodities and oil stocks, which have been heavily squeezed as commodity prices have tumbled, have meant numerous ethical funds have outperformed their benchmarks. Clearly, there is still the opportunity for significant gains for ethical investors. Maybe my biggest gripe with investing in ‘ethical funds’ is that I would not consider all to be ethical. Again, this issue is rooted in the problems of defining what constitutes an ethical investment. What I consider ethical, you may not consider ethical – there is scope for some serious ambiguity. Because there is no standardised definition – perfect or imperfect – the way funds are investing ethical money is very unclear and varies greatly. As result, you have to rely on the fund manager’s interpretation of ‘what is ethical’, which is rarely coherent or clearly communicated to investors. This is a major problem with ethical funds. Aberdeen Ethical World Equity: 3rd largest holding in US shale gas giant EOG Resources and also holds roughly 5% in PepsiCo. Legal & General Ethical Trust – 4% of the fund invested in oil and gas. No doubt some investors have invested into these funds assuming that they are ethical but would not invest in companies such as these. If you are considering investing in an ethical fund, make sure you look at the following things. An issue with ethical investing at the moment is that it is at a midpoint between a fully fledged area of investment and bit-part PR exercise on the side of the investment houses. This confuses things for investors. Some funds are run by fantastic managers, who have a clearly defined investment strategy and all stock selections are underpinned by great research. However, on the other side, you have some funds which offer ethical funds as a PR sham. The danger here is that, while there is little research to support this, investment firms assume that ethical investors are happy to sacrifice returns in order to act ethically. A fund that thinks this is not worth your money – there is very little evidence to support this. In my opinion, funds that try to use the ‘green’ excuse to justify bad performance really misunderstand ethical investing and the aim of ethical investors. If you have read this far, you might wonder where we will go from here. I appear to have torn into the ethical funds available on the market. There are many top quality ethical funds out there, but the aim here was to point out that ethical funds vary greatly in terms of motivation, quality and strategy. As always, it’s incredibly important to research the fund before you invest in it. As a result, going forward this series will look at potential stocks, not funds, and analyse why they may or may not be considered ethical investments. Trader Tim is a writer for 7 Circles, ADFVN, Sentifi & his own blog. You can also find him on Twitter. He writes to help readers learn from both his trading successes & failures. Thank you so much for this! This is, hands down, the most even handed and sensible thing I’ve ever read on ethical investing. I feel like investing types tend to dismiss it out of hand, while the people who these funds appeal do not necessarily have the investing knowledge to think about whether something is really a good investment. You have raised a lot of really important issues–I look forward to seeing how they are addressed in subsequent posts!